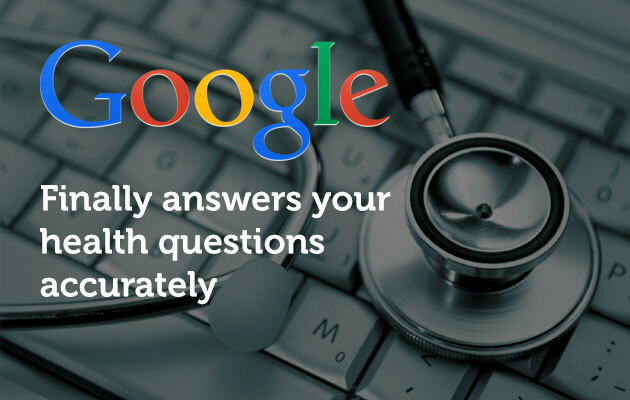 Google has announced a very welcome decision to add high quality medical data to its search results to help answer your health questions more accurately. According to Google, 1 in 20 Google searches are for health related information, so it’s about time they made a decision to allow users to find the health information they need “more quickly and easily”. The search giant wants to help encourage users to consult high quality websites when it comes to health issues, rather than turn to poor quality, unreliable ones. The new feature on the Google App and Google Search will see the answers to ‘common’ health questions returned without users having to click on a link. Information without clicking is already a Google feature for searches such as dictionary definitions, famous people and high profile sporting events. The information comes from Google’s own ‘Knowledge Graph’, which supports its instant search results and underpins the Google Now personal assistant and app. A kind of built-in encyclopaedia, the Knowledge Graph can produce graphs and information from a number of Google verified sources. Any new medical knowledge added to the Knowledge Graph will be checked for accuracy and verified by the physicians from the Mayo Clinic on a regular basis. Google worked with a team of doctors to compile and review accurate medical information that could be used. They gathered the information using real-life clinical knowledge combined with high-quality, trusted medical sources around the web. The information was then reviewed and verified by the team of professional doctors as well as the Mayo Clinic to give the highest level of accuracy. From now on, on average, each piece of medical information presented in response to a Google health search will have been looked over by more than 11 different physicians, Google says. ““What we present is intended for informational purposes only – and you should always consult a healthcare professional if you have a medical concern”. The new search results based on Google’s own medical research have been rolled out in the US this week in English, and will be rolled out to the rest of the world at a later date. The search giant also plans to cover more medical conditions. It is possible part of an industry-wide move to start providing effective and accurate health information online, to compete within the growing industry of providing health information online to drive ad views which has emerged in recent years. If you need help making your website stay relevant in Google Search, why not get in touch today?